The following settings are valid for all Microsoft based email accounts. This includes Outlook.com, Windows Live and Hotmail. Microsoft has rebranded these services to one name, Outlook.com. 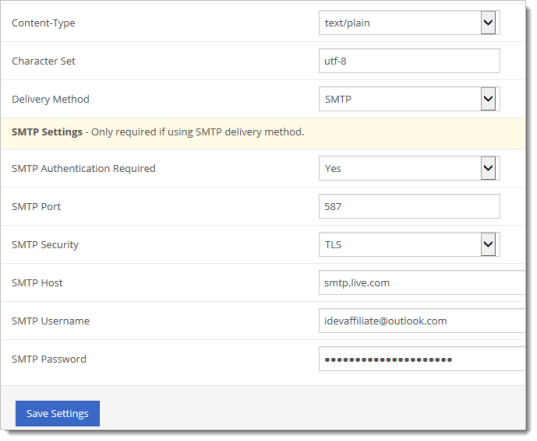 The following are required SMTP email settings for mail delivery. These are the stock/default settings provided by Microsoft. We have tested and can confirm they work. However, any SMTP email connection is dependent upon your hosting server being able to connect to the email server (Microsoft). Please be sure to review all the information provided in this tutorial including your settings and troubleshooting sections. SMTP Username: [email protected] or [email protected] or [email protected], etc. You may not be able to instantly connect to the GoDaddy servers, as we expect should happen. This can be due to a few different things. Check with your web hosting provider to ensure port 587 is not blocked for the outbound connection. Check to make sure 587/TLS is OK to use in general or if there maybe be anything else preventing your hosting server from making the connection. Your web hosting provider will need to assist you with this task. This is purely something your web hosting provider needs to look at for you. You’re welcome to open a support ticket with our support dept. but please know there is little we can do to assist here. Everything we have to offer in terms of Outlook.com connectivity is in the tutorial here.